Catawba Meadows Parks covers more than 230 acres in Morganton, and there is a lot to do at the park! In addition to the premier softball and baseball facilities, residents and visitors can enjoy 2.5 miles of greenway along the Catawba River; an 18-hole disc golf course; sand volleyball courts; corporate picnic shelters; acres of open space for picnics, public rest rooms, plus many special events. No pets are allowed in the baseball, softball or soccer areas. Ready for a game of disc golf? Catawba Meadows Park offers an 18-hole course that weaves through the former seed orchard at Catawba Meadows. The 18-hole course at Catawba Meadows Park starts to the left of the corporate picnic shelters. Players will complete three holes before crossing a creek to finish the course in the former seed orchard. Players can throw from the amateur or professional tee boxes marked by red or blue, respectively. From Downtown Morganton, take N. Green Street north. Turn right on Sanford Drive. Turn left into Catawba Meadows. Turn left at the intersection and turn left into the parking area. Exploring Joara Foundation (EJF) partners with the City of Morganton to offer a Living History Center at the Catawba Meadows Park. The Living History Center is an interactive interpretive center which is located on the site of a significant 16th Century Catawba Indian town. Excavations yielded information that allowed EJF to accurately reconstruct sixteenth-century buildings at the Catawba Meadows site. 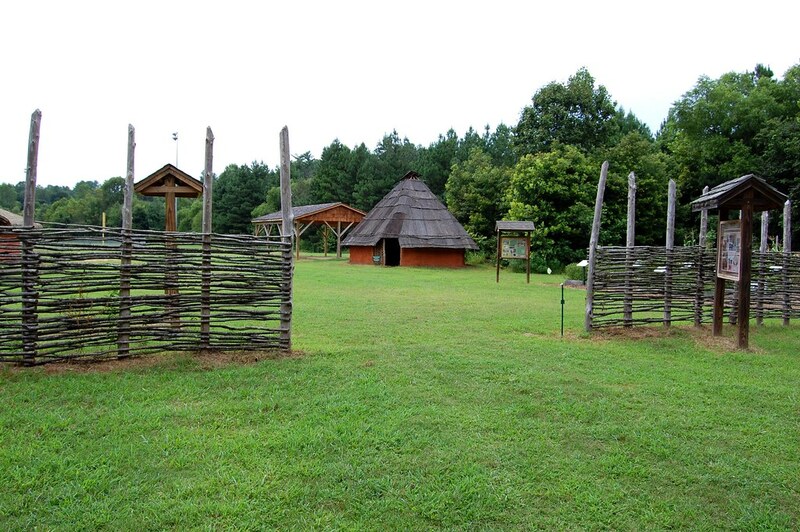 EJF began development of the Living History Center in the Spring of 2012 and completed the Native Phase in 2016 on land at Catawba Meadows Park provided by the City of Morganton. EJF currently hosts a variety of school and community programs at this site. For more information on events at Catawba Meadows, check our Events Calendar. EJF welcomes community members and visitors to walk through the Living History Center during visits to Catawba Meadows Park. Planning for a Spanish Phase, including a replica of Fort San Juan and a museum, is underway and EJF is currently raising funds for this project. The Beanstalk Zip Lines Journey at Catawba Meadows Park is a blend of a zip line tour and a ropes course that incorporates fun and excitement with education and recreation for children and adults alike. The Journey transports individuals and groups through a labyrinth of independent tree houses which serve as rest stops and educational destinations. Each station offers 360-degree views suspended as high as 50-feet above the ground. The Journey offers different levels of physical challenge and adventure ranging from easy and invigorating to advanced and exhilarating. Every outing shares the common goal of generating positive appreciation for nature, local history and the environment with a special focus on each individual's self-esteem, physical fitness and revitalization of the human spirit. Adventures can be tailored to most any skill level and we also offer customized outings for special needs guests. *Note: If a large group requires more than one shelter for an event, they can reserve all 3 shelters for $200.00 for 4 hours and $25.00 for each additional hour per shelter. Drinks, food, snacks, candy, shirts and more are available for sale at the concessions stand on site. In the early 1990's, the City of Morganton acquired large amounts of property along one of western North Carolina's most cherished natural resources, the Catawba River, which meanders nearly 8 miles through the corporate limits of the city. Through aggressive grant writing campaigns the City was able to acquire nearly 6 miles of river front in the early 1990s. One of the properties acquired by the City during its Greenway development process, consisted of a very large 230 acre tract of land. The land was situated adjacent to 2.5 miles of river front approximately eighth tenths of a mile from the center city. The City had initially anticipated developing an active public park on the property, but the faltering economy caused the park's development to be delayed. The City was approached by a local sports promoter with the idea of utilizing the delayed 230 acre planned park facility as a regional and national amateur baseball and softball event facility. The City was intrigued by the idea but also skeptical. The promoter was asked to develop a business plan to help local officials better understand how amateur athletics could bring people and dollars to our area. In April of 2006, the City of Morganton opened the first phase – five little league fields – to a huge crowd of local citizens and as well as local little league teams. Following the opening of the park, the sports promoter hosted his first regional tournament event which brought 93 baseball teams to our area. In the spring of 2007, the City opened the second phase of the complex – four softball/baseball fields. In the fall of 2009, the City completed Phase 3 of the park, which added 3 corporate picnic shelters, an 18-hole disc golf course, a festival area, bathrooms and more greenway path. Traveling Amateur Athletics is now big business. It generates new business in the United States and offers a tremendous economic development opportunity for Morganton and Western North Carolina. The Catawba Meadows project is modeled after similar facilities in Southaven, Miss., Atlanta Ga., and Cooperstown, Penn. Public and private sponsorship made the Southaven facility one of the States largest tourism regions and it recently won a State Economic Development Award.